Lying to your doctor is encouraged in one situation: when your doctor is a student and you're an actor asked to portray a certain condition. My friend Amy Savage does this for work. In between fake symptom bouts, I asked her to write a guest post sharing what she's learned from being poked for practice. Have you ever been asked to “please dislocate your left breast,” or if you “have noticed any hairs growing in places you normally wouldn’t have hairs"? Or maybe someone told you to “have a nice day” after your spouse just passed away or you’d received a cancer diagnosis. Not only do I hear things like this from time to time at my job, but I have grown to expect them. I have been working for several months as a so-called standardized patient. 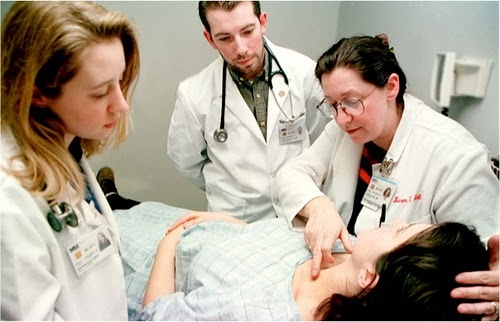 The local medical school runs an excellent program that lets students conduct histories and physical exams in a simulated, standardized setting. This means I (and many others) pad around in rubberized socks and breezy hospital gowns and feign myriad diseases, syndromes, conditions, and (sometimes nasty) habits. It also means I overuse hand sanitizer and have many strangers listen to my heart, palpate my abdomen, and poke me with a broken wooden Q-tip to test my sensation. One time I even let someone stick their gloved hand in my mouth and squeeze my tongue a little. As a standardized patient, I have to memorize case materials for fictional patients. This means memorizing not just a list of symptoms and how long the “patient” has had them, but also the patient’s occupation, education, diet, marital status, drinking habits, exercise, stress, family history, and past medical history. If I am supposed to experience or not experience pain when they poke me, or have a knee jerk reaction (literally), I’d better be ready with a realistic response. This involves a bit of groaning, some crying (in the case of bad news), and some bona fide reflexes. Most often the students show concern and empathy. In the rare case, though, that they say something a patient could perceive as judgmental, we “patients” get to act grumpy and less compliant. I am expected to give specific, memorized lines about my symptoms, but only if the students ask the right questions in the right way. For example, if a student asks if I use tobacco, that is different from asking if I use or have ever used tobacco products. Asking a woman if she has ever been pregnant is different from asking if she has any children. And, of course, those types of oversights in questioning can lead to different diagnoses. Luckily, I am not just a living cadaver for the medical students to practice on. I also give feedback. We evaluate the students on things such as how they organize their questions; whether they display empathy; how they perform the physical exam; and how they communicate the possible diagnoses to the patient. After the exam we have time for students to ask questions and for the standardized patients to give suggestions—like how to encourage patients to change their habits, or what would be better wording to deliver bad news. I've also learned that it's important to pay attention to symptoms that may seem unrelated to your chief complaint. If you were experiencing extreme fatigue, for example, you might not think that your newly brittle hair had anything to do with your energy levels, but it could be a thyroid problem. Even though I am trained to train medical students, this only means I know what (or how) they are supposed to ask or not ask. 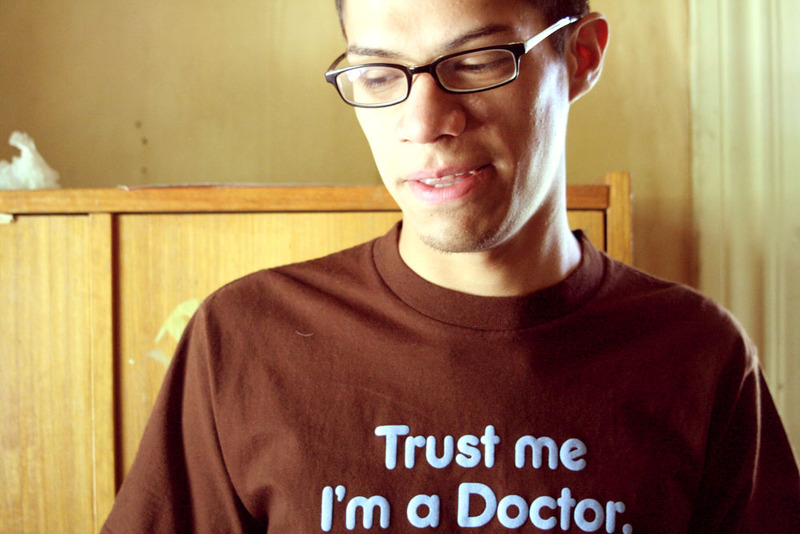 It did not necessarily mean I knew what to ask when I saw my own doctor. The student left to get the doctor, and when they returned the doctor moved my knee cap around a bit and then suggested that I might have premature arthritis (I’m close to thirty) and that I may need cortisone shots and physical therapy. I refused to believe this, but said “Oh, okay,” nodding complacently. The student and the doctor left the room to give me time to get my pants on, and when they returned, the doctor admitted that the medical student had come up with another possibility: runner’s knee. I read the photocopied pamphlet they handed me, and it fit all of my activities and symptoms. I was grateful that my physician was willing to listen to the medical student, though a bit terrified to think what I would have put myself through if she hadn’t. Though I know better now from my work as a standardized patient what the doctor could and should ask me, I am still at their mercy if they do not ask the right questions and listen carefully to the answers. • Find a physician who will ask you many questions and listen carefully to the answers. Do not assume, if you’ve talked to a medical student or other proxy, that they have conveyed all the information to the physician. • Pay attention to your own body. Notice when the pain started and what makes it better or worse. Does it happen at a certain time of day or after certain activities? Have you changed your diet recently? Tell your physician about everything you’ve noticed that is not normal for you, even if you don’t think those other symptoms or changes are relevant. • As I learned with my knee problem, some medical students—because they are not overly confident and are willing to ask, not assume—are better than some doctors. Studies of ants have the ring of medieval epics: there are queens, castes, warring soldiers and scouts. Certain ant species go on violent raids of neighboring colonies, picking up the young in their jaws and carrying them back to their own homes. The stolen ants become workers that live to serve these "slave-makers." A newly discovered slave-making ant species, though, sometimes accomplishes the same kind of coup without the need for violence. Slave-making ants live all over, but scientists have so far found the new species in just three spots. In the early 2000s, the ants turned up in a state park in Vermont and a nature preserve in Rensselaerville, New York. 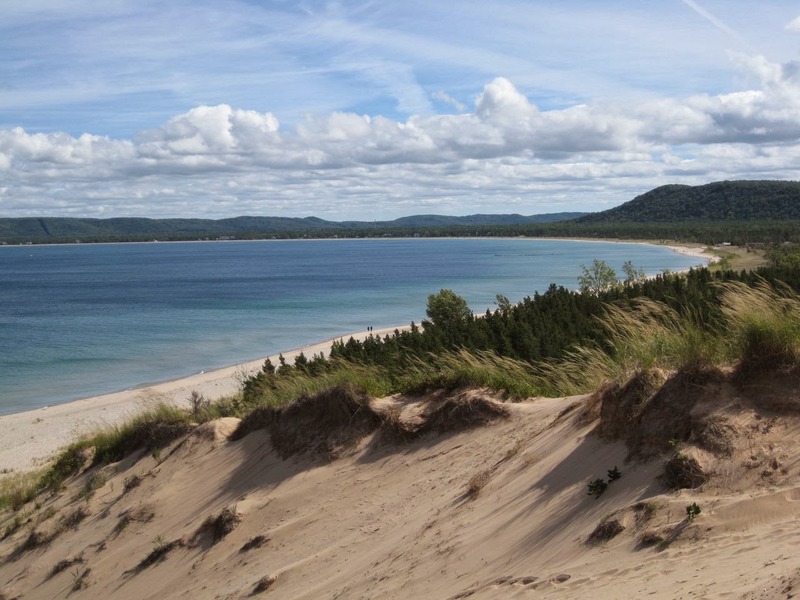 In recent years, they've been found at Sleeping Bear Dunes National Lakeshore in Michigan. If you stand on the Sleeping Bear dunes, you might never guess that this postcard-perfect vista hides a small-scale war. But in the forest, tucked inside holes in acorns, sticks, and hickory nuts, Temnothorax pilagens—the "pillage ant"—is at work. 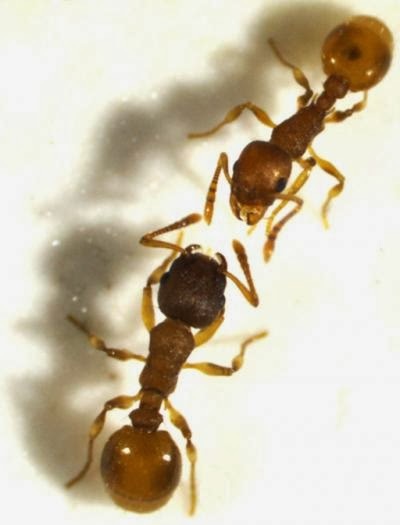 Bernhard Seifert of the Senckenberg Museum for Natural History in Goerlitz, Germany, and his colleagues say pillage ants have two preferred host species: Temnothorax longispinosus and Temnothorax ambiguous. Yes, all three share a name because they're relatives. "Ninety percent of slave-maker ants are related to their slave-species," Seifert says. The pillage ant is "much closer than usual" to T. longispinosus, though; comparing the ants' DNA revealed that the two are sister species. The slave-makers don't treat these sisters well. Scouts from a slave-maker colony go out looking for nests to raid, either alone or with up to four worker ants following. When they find a target and charge inside, they may meet resistance. In this case the slave-makers make "frequent and effective use of the stinger," the authors write: a sting by a pillage ant quickly paralyzes and kills a host ant. In the raids that the scientists observed, casualties in the invaded ant colony could reach as high as 100 percent. Yet the takeovers could also be peaceful. In some cases, especially in nests without a queen, the invaded ants barely objected to their pillaging guests. Slave-makers carried off not just larvae and pupae from the colony, but adult ants too. "Occasionally, host workers [tried] to drag slavemakers out of the nest," the authors write, but at other times they didn't resist. The whole raid could go off with hardly any violence. The scientists think pillage ants somehow disguise themselves, so that ants in the invaded nests surrender without objecting. Seifert says "different forms of camouflage" could be responsible. The slave-makers might mimic the coloring, shape, or movement of their hosts well enough that the hosts don't notice when the raid begins. Or the mimicry might be chemical—pheromones given off by the slave-makers might convince their victims everything's fine. Back at the pillage ants' home nest, a typical colony includes about four workers and a dozen slaves. Compared to other slave-makers, the pillage ant is unusual for its tiny raiding parties. Seifert says this species is also unique in that a "good number [of] raids can be undertaken without experiencing resistance." Surrounded by the beauty of the dunes, the slave-makers' victims are lulled into submission. By the time their young grow into hostage adults in their enemies' nests, it's too late to fight. Images: (top) Miriam Papenhagen; (bottom) me. Note: It's not always too late to fight. In what scientists call a "slave rebellion," some enslaved ants have been seen tearing their captors' young to pieces or abandoning them outside the nest. For the most part, people move in and out of our lives at a trickle: a new coworker becomes a friend; a neighbor moves away. But there's at least one cataclysmic monsoon in a young person's social life, and that's high school graduation. So long, hometown chumps! Hello, dorms! When scientists used cell phone records to track the social networks of people graduating from high school and starting the next phase of their lives, they saw a huge turnover in friends and acquaintances. Remarkably, though, the overall structure of each person's network stayed the same. "We wanted to see what happens to social networks when there is a big disruption," says Jari Saramäki. A professor at Aalto University in Finland, he leads a research group studying complex networks. In 2007, Saramäki and his coauthors gave cell phones to 24 soon-to-graduate high schoolers in a large city in the United Kingdom. The phones came with an 18-month contract and a guarantee that all their call data during that time would be collected by researchers. After graduating, a quarter of the subjects stayed in their home city and got jobs; the rest went off to universities nearby or in other cities. At three points during the study, the young people filled out questionnaires about their phone use. 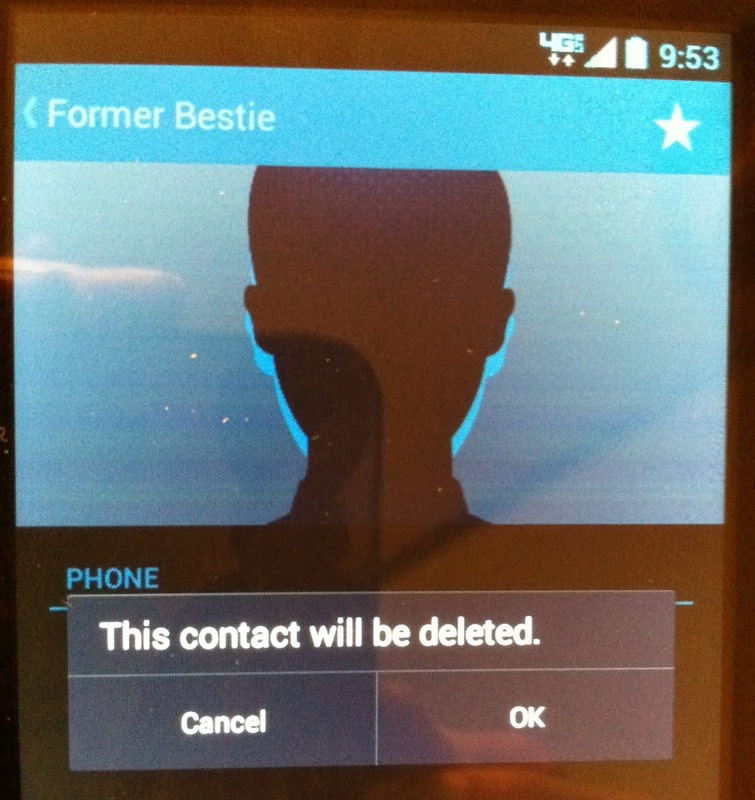 They listed all the friends, acquaintances, and family members for whom they had contact information, and rated the closeness of their relationships with each person. The researchers combined this information with the call records to piece together each person's network: who were they calling, how often, and how close were they to the people they called? The graph on the right is this person's "social signature." There were some patterns among subjects. For example, an average of 20 to 25 percent of calls went to each person's top-ranked acquaintance, and nearly half of calls to their top three acquaintances. Nevertheless, each subject's social signature had a distinct shape. Over time, the graduating students had huge turnover in their networks. Within all top-20 contacts, 42 percent were people added in the middle section of the study. Yet statistical analysis showed that for the most part, the shapes of these social networks stayed the same. "I would have expected that when the participants begin their first university year, there is some dramatic, temporary effect on their network shapes," Saramäki says. "What was really surprising is that [network structures] do not change much, even when this turnover is there." Of course, phone calls don't give a complete picture of a person's social activity—there are also text messages, for one thing. But Saramäki says texts can be "problematic." Not everyone's parents text, for example, and some interactions might be completed in one message while others take a dozen back-and-forth volleys. "We do have data on text messages for this study and are working on it," Saramäki says. "But judging from what we have seen so far, it looks like the text message data tells pretty much the same story." Even when people overhaul nearly all their friends at once, they seem to just slot the new acquaintances into the old social structure. The researchers point out that people have a limited amount of time to spend on their friends, and the brain may have a finite capacity for keeping track of others. So it's possible that people allot those resources in a consistent way, no matter which friends they currently have. 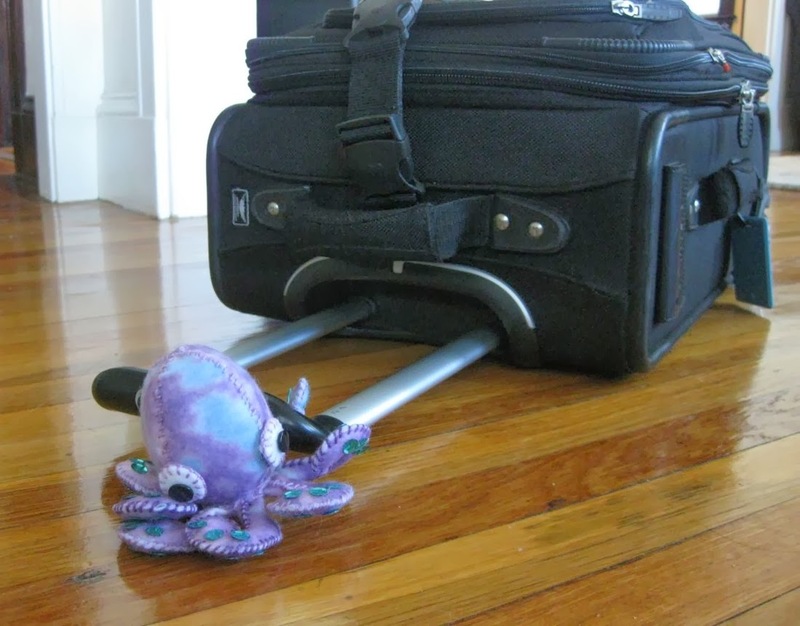 It seems you can't shake your social network—wherever you go, there you (and they) are. This post has been edited from an earlier version. For an easily crushed animal that rests during the day, a highway seems like maybe the worst possible home. Yet some bats pick roosts that are under bridges, or in other spots booming with human noise. Why subject themselves to that? For bats of at least one species, the sound of traffic is easy to doze through. And the more they hear it, the more they ignore it. The greater mouse-eared bat, Myotis myotis, often turns up under bridges in Europe. Jinhong Luo, a PhD student at the Max Planck Institute for Ornithology, wanted to know how they can tolerate the noise. He and his colleagues trapped male bats from a cave in Bulgaria and brought them back to the laboratory for a hearing test, which was really a sleeping test. Well, not sleeping exactly. Like many other bat species, the greater mouse-eared bat goes into "torpor" during the day, which is like a mini-hibernation. 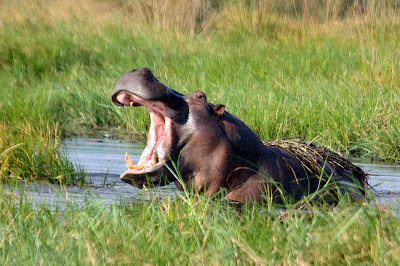 Its metabolism and body temperature drop sharply, letting the animal conserve energy. In the evening, the bats start to stir. After waking up gradually, they head out from their caves (or under-bridge roosts) to hunt. The researchers created several different sound recordings that they would play to roosting bats to try to wake them up. There was a recording of the bats' own colony, another of local bird sounds, and one of trees rustling in the wind. The authors also created recordings that mimicked highway traffic passing 25 meters, 50 meters, and 100 meters away. Each bat was housed by itself for the sound tests. 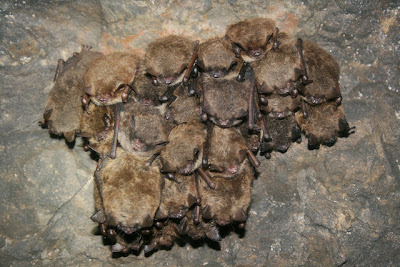 Over the course of two roosting days, the bats heard each recording twice for five minutes. By monitoring temperature sensors on the animals' skin, the scientists could see whether bats started to wake up—that is, warm themselves—after hearing each sound. Luo and the others tested a dozen bats. (They started with 15, but two weren't snoozing deeply enough to run all the tests, and one somehow pulled the temperature logger off the middle of its back.) The bats were most likely to wake up after hearing the recording of their colony, or the sound of rustling trees. But traffic sounds were least likely to wake them. Bats responded more strongly to all sounds later in the day, as it got closer to their normal waking time. It's not too surprising that bats respond to the squeaks and shuffles of their own colony, which might hold useful information. But why the windblown trees? A likely answer is that Myotis myotis doesn't hunt by echolocation. Instead, it listens for the sounds of beetles walking through the grass. Since the bats are already attuned to the noise of swishing vegetation, it may make a good alarm clock. As for the sound of cars passing, Luo points out that most rumbling traffic is at a lower frequency than the sounds of a bat colony or rustling leaves. Since bats hear better at higher frequencies, this means traffic noise is "basically out of the best hearing frequencies for nearly all bat species." However, Luo is quick to add, "We would never claim that traffic noise is not disturbing to roosting bats or even to torpid bats." The bats in his study did respond slightly to traffic noise, raising their body temperatures compared to when there was silence. And bats might react differently to highway sounds when they're awake, or when they're roosting but not in a state of torpor. Whatever sound they heard, bats responded less on the second playback, or when it was played continuously for an hour. They were especially quick to adjust to traffic sounds. Like a teenager sleeping through an alarm clock, bats can tune out a familiar noise more easily. But that doesn't mean they're immune to harm from their noisy human neighbors. We just don't know all the ways that living with our roads and other rackets might influence them. "To be honest, we are in the very beginning of understanding the potential effects," Luo says. "Answers are not always straightforward." Not so much a popularity contest as an altitude contest. The fuzzy and springy Euophrys omnisuperstes lives on the world's highest mountains. It's been found 6,700 meters (a little over four miles) high on Mount Everest. Some birds can fly at higher altitudes, but the spider lives there full-time, apparently subsisting on unlucky insects carried up to it by the wind. Twice this year, Iran announced that it had successfully sent a monkey on a sub-orbital rocket flight. The trips allegedly happened in January and December, both reaching heights of 120 kilometers (75 miles) before safely returning their rhesus macaque-nauts to Earth. But the Associated Press pointed out that the launches couldn't be confirmed by outside sources, and that one post-launch photo showed an entirely different monkey than pre-launch. On April 19 of this year, a Soyuz rocket took off for space carrying a capsule full of animals. Called Bion-M1, the capsule held mice, mongolian gerbils, geckos, fish, and snails. The mice were shared between Russian scientists and NASA, whose researchers would study the effects of low gravity on cell growth, blood flow, joint movement, and sperm motility, among other body functions. The mission orbited Earth for 30 days. NASA writes, "All of the mice that Russian scientists had shared with their U.S. colleagues returned from space in good health." The Russian scientists must have kept the dead ones for themselves, then, because 29 out of the 45 mice didn't survive. All 8 gerbils perished too, along with the fish. There appeared to have been technical problems with the systems built to feed and keep the animals alive onboard. "NASA Curiosity Rover spots iguana on Mars," declared a Fox News headline in November. It was actually a rock shaped vaguely like a lizard. But someone from a website called UFO Sightings Daily was calling it an "animal" and doing news interviews. Back in May, the same paranormal website had announced the discovery of a "Mars rat" in another one of the rover's photos. It was, of course, also a rock. Will any Earth animals travel farther from the planet's surface in 2014? If they do, here's hoping they fare better than a Mongolian gerbil. Honorable mention for effort: NASA launchpad frog.